The NIAA and the infamous Neil Hammerschmidt are at it again. Having an expensive meeting to figure out how to subject livestock growers to “enforcement” measures for RFID tagging of livestock. They are after the cattle, as they always have been. The National Institute for Animal Agriculture (NIAA) announces an impressive agenda for the upcoming day and a half Strategy Forum on Livestock Traceability which they will co–host with the US Animal Health Association (USAHA) in Denver, CO in September. The Strategy Forum will kick off with an introduction from Dr. Tony Forshey, Board Chair, National Institute for Animal Agriculture and Dr. Boyd Parr, United States Animal Health Association. Mr. Matt Deppe, Executive Director, Iowa Cattlemen’s Association (Invited) is scheduled to moderate the Strategy Forum as first day continues with updates on the USDA Animal Disease Traceability (ADT) program and feedback on public meetings from USDA APHIS Veterinary Services Cattle Health Staff/Animal Disease Traceability Veterinarian Dr. Sunny Geiser–Novotny and Dr. Aaron Scott. The Strategy Forum on Livestock Traceability will be held September 26 –27, 2017 at the DoubleTree by Hilton, Denver–Stapleton North, Denver, Colorado. View the entire AGENDA HERE. Register HERE. Computers Can Change Your Memories….Part of Mandela Effect Equation? There is an article about how computers can now alter your memory and your thoughts. It’s heavily linked and very worth reading. In my opinion, this is likely part of the Mandela equation. And before people begin asserting that those who recognize the effect are those who have had their memories wiped, I need to point a few things out. First, there are a great number of residual residues indicating that those who recognize the effect are recalling a lot of things correctly. Like the Lion and the Lamb figurine with Isaiah 11:6 on it. Microfiche ads for Fruit Loops and Charles Schultz, and James Earl Jones saying “Luke, I am your father….and your uncle” on a night show interview. Letterman introducing Sally Fields…Lots of things. And granted, some things people think are evidence of the effect are actually incorrect recollections. “Thou canst not touch the freedom of my mind,” wrote the playwright John Milton in 1634. But, nearly 400 years later, technological advances in machines that can read our thoughts mean the privacy of our brain is under threat. 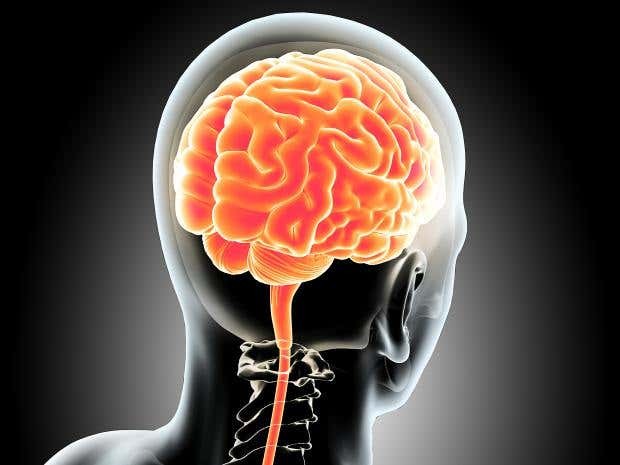 Now two biomedical ethicists are calling for the creation of new human rights laws to ensure people are protected, including “the right to cognitive liberty” and “the right to mental integrity”. Scientists have already developed devices capable of telling whether people are politically right-wing or left-wing. In one experiment, researchers were able to read people’s minds to tell with 70 per cent accuracy whether they planned to add or subtract two numbers. Facebook also recently revealed it had been secretly working on technology to read people’s minds so they could type by just thinking. And medical researchers have managed to connect part of a paralysed man’s brain to a computer to allow him to stimulate muscles in his arm so he could move it and feed himself. So, back to how I find this to be very likely to be part of the Mandela or Quantum Effect. First of all, while it would probably be less upsetting to people, we are not in an alternate dimension, nor have we slipped time. Were either of those things the case, there would be no residuals available. We have these things out there that make it impossible for all of us to have “jumped” a dimension or time line. So, what I think is this…Put on your woo woo goggles, okay? Satan has to use technology to try to achieve the omniscience, omnipotence and omnipresence of the Most High YHVH. The level of technology that we now have is beyond Orwellian. There are psycho and technotronic weapons, lots of them actually. The most famous is probably the Voice to Skull tech. You can research this on your own if you like. If you have the stomach for it, you can then look into “targeted individuals”. So….Here is what I think in a sci-fi nutshell. I think that there is an interface between nanoparticles, Cern, quantum AI computing that is manifesting changes on the quantum level of physical objects and historic occurrences. I think Cern opens up a potential pathway for the AI quantum computers to mess around with our reality on a quantum level and do nearly complete editing of things in the physical and also, through nanoparticles to rewrite many people’s memories of things and very significantly minimize evidence of a change occurring and cause people to simply NOT recall anything different than what the new paradigm desires to put forth as the current truth. I believe this is all demonically directed and that the people involved in the various parts of the equation that are changing provable reality are not actually cognizant of everything that is being done. Since the brains of people are all individually different in some ways, it appears that the overwriting of memories is not something that can be done with 100% certainty. Just as there are approximately 20% of people that cannot be hypnotized, there are maybe 30% of humanity that cannot have their memories readily overwritten by the AI controlled quantum realignment. But they could improve their tech….I hope not. I’m sure that I will get a rash of negative comments regarding my theory, and I have officially crossed the line beyond caring. There may be more things in this “matrix” than the ones I have isolated above, I am willing to continue to look. However, what I am concerned about is that now that the first article referenced above is effectuating disclosure of nothing less than computer enhanced mind control, that people who lack the ability to overcome the synthetic overwriting of memories may be subject to believing lies that they otherwise would readily detect. I think this is possibly an avenue for a type of “zombie apocalypse” if you will, where people will be fully convinced in their own minds of “facts” that have no basis in actual, unadulterated reality. I also think that the simple act of being aware of this may shield people from having their very own minds violated by technological “intelligence”. It’s a little twist on what is called the Hawthorne Effect. Being aware of a change in observation (everything we do is being subjected to algorithm measurements and predictive behaviors predicated upon those algorithms) might very well make the desired outcome of those who want to mess with our minds much less effective. Your thoughts are welcome, but please don’t go into the “you’re a moron” realm. If you do, I will delete it. If you simply disagree and state why clearly and concisely, that is completely fine! Should anyone still think that GMO’s and Round Up aren’t seriously harmful, they need to read this article and go through all the links showing the intentional obscuring and falsification of studies on this disgusting chemical. Below is an excerpt from the article, and the link is the heading. We should be able to trust that the food we buy is safe, but when the people in charge of that are working to keep unsafe chemicals on the market – we have a huge problem! Along with so many of you and fellow activists, we have been spreading the truth about GMOs and hazardous chemicals used in conjunction with them like Roundup (glyphosate). This weedkiller isn’t just used on GMOs but on 70 different food crops in the U.S. – it’s in practically everything Americans eat. So, if glyphosate is causing cancer and other diseases, I want to know about it and get it out of our food – don’t you? Stating the obvious: Monsanto makes billions off of Roundup sales, so they don’t want anyone to question its safety. Some never-before-seen confidential documents just released in a court case against Monsanto give us a glimpse into how they are working to influence the EPA (who is in charge of determining whether they are allowed to sell Roundup anymore) and undermine any efforts to ban its use. 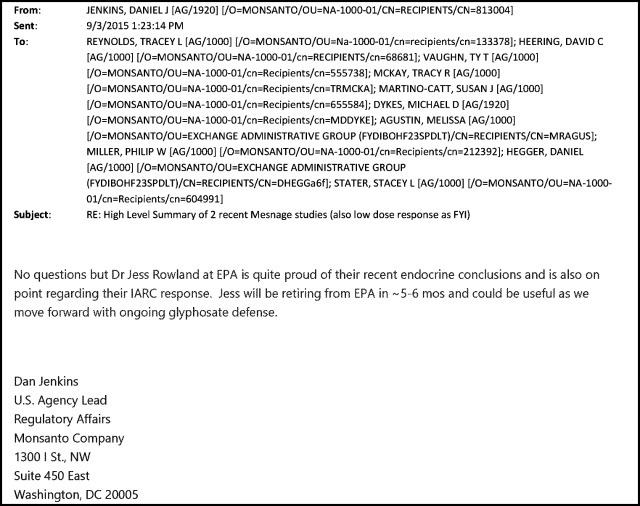 These documents show what many of us have known and suspected for quite some time… Monsanto is manipulating scientific research and has gotten some EPA officials on their side who seem to be helping them cover-up the health dangers of Roundup so they can keep it on the market. 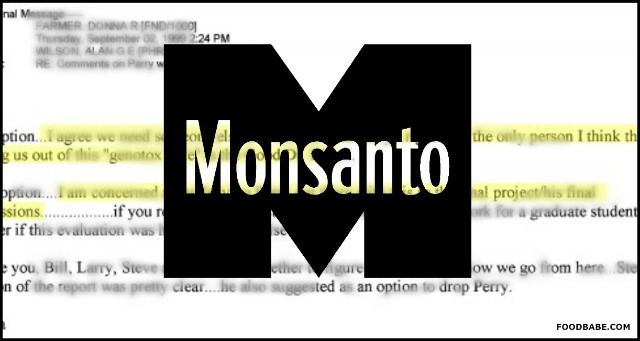 Keep in mind… Monsanto and the EPA both do NOT want the public to see these internal emails! Why do you think that is? While Monsanto is being sued in California by dozens of people who claim Roundup caused their non-hodgkin’s lymphoma, Monsanto had to provide over 6 million pages of internal emails and documents to the court and attorneys, and marked the majority of them as “confidential” so they’d be hidden from the public. When the plaintiffs asked the court to make the records public, both Monsanto and the EPA objected. The judge didn’t agree with their objections and threatened to sanction Monsanto if they continued trying to seal documents and found it in the best interest of the public to release them for all of us to see,“even if Monsanto doesn’t like what they say”. The public interest group U.S. Right To Know is publishing these documents in their entirety on their website here. This is just the beginning and more are coming out. Monsanto was in private talks with a top official at the EPA, Jess Rowland, who was in charge of evaluating the cancer risk of glyphosate for the EPA. Rowland was allegedly helping them stop another federal agency from investigating whether glyphosate causes cancer and told a Monsanto employee, “If I can kill this I should get a medal”. Rowland also signed off on the mysteriously leaked and deleted EPA memo which found glyphosate “not likely to be carcinogenic to humans”, which Monsanto touted as proof the EPA finds it safe. A Monsanto employee proposed they could “ghost-write” portions of a scientific report and then just have hired scientists “sign their names so to speak”. 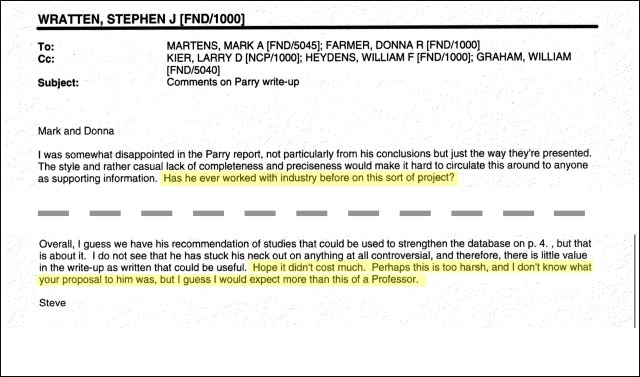 The EPA would later use this report evaluate the safety of glyphosate. The reason they would do this is highly unethical – to make the report appear to have been prepared by independent scientists, when in reality Monsanto wrote it! This begs the question, how often do they do this? 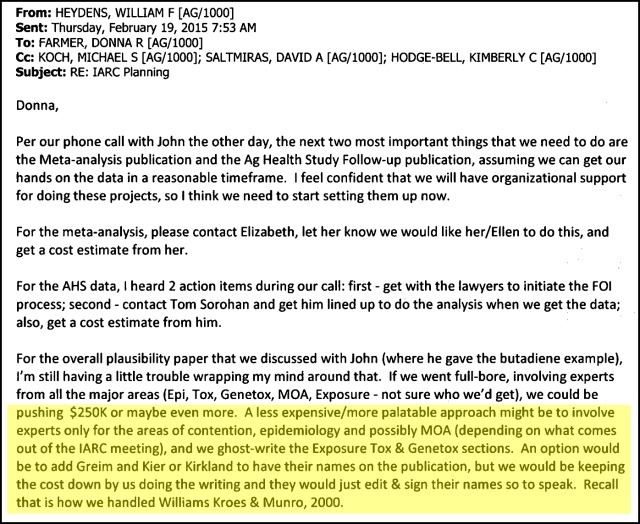 An email suggests they ghostwrote this report presented to EPA regulators in 2000, although no Monsanto employees are listed as authors. Way back in 1999, Monsanto buried the findings of their own scientist (Dr. James Parry) who found glyphosate is genotoxic and recommended further testing. 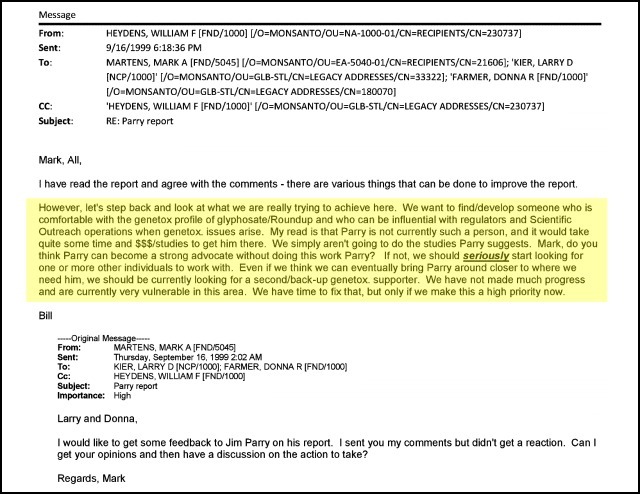 Internal emails show that Monsanto employees questioned whether Parry had “ever worked with industry before”, “hoped that it didn’t cost too much” and that they should hire a different expert who would be “influential with regulators” and help them with “outreach” efforts. Ha! They only want to hire scientists who will make findings in their favor to deceive our regulators. Monsanto knows other compounds in Roundup such as NNG and 1, 4 Dioxane are toxic and can cause cancer as they acknowledged this with each other in emails mentioned in court docs: “If you talk to Kerry [Liefer, an EPA employee], I wouldn’t push the NNG issue too hard — don’t want to draw attention to the toxicity of our product”. 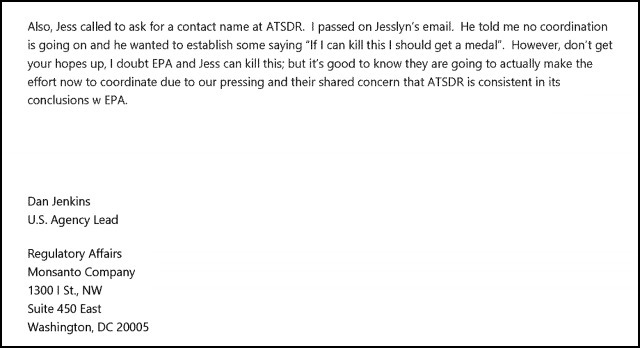 In another 2015 email, a toxicologist at Monsanto hinted that Rowland would be retiring from the EPA and that he’d be useful for their “ongoing glyphosate defense”. This just further shows that Rowland was in Monsanto’s back pocket all along and is a key player in helping them achieve their mission. They are feeding us lies and these secrets are poisoning us! Most Americans are eating glyphosate every day… No matter how healthy we eat or how much we try to protect ourselves from it, this weedkiller is being used on most major conventional food crops and is so rampant in our environment that it is contaminating virtually all of our food. It’s been found in honey, cereals, meat, drinking water, breast milk, infant formula, chips, cookies… the list goes on. Our government agencies (FDA and EPA) know this and are allowing corporations to poison Americans for profit. It’s truly disgusting! Monsanto is stooping to corruption to continue selling their poisons. 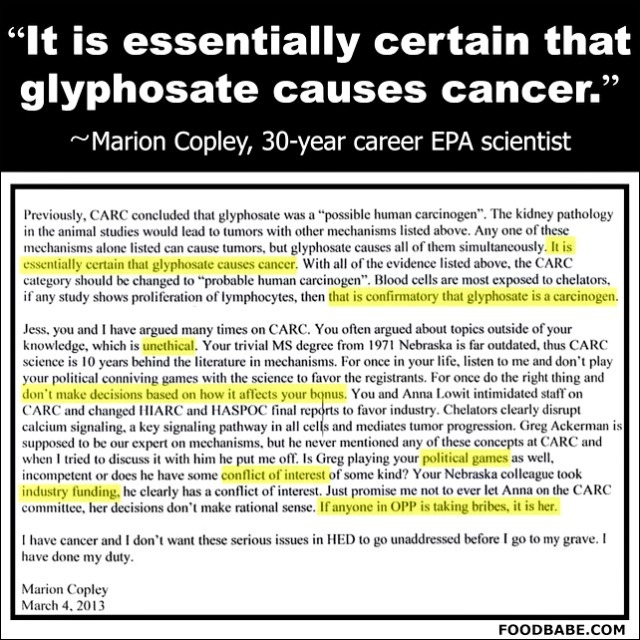 Everything from seeking to keep their correspondence with the EPA secret, to intimidating scientists at the WHO International Agency on Cancer (IARC) who found Roundup’s active ingredient glyphosate “probably carcinogenic”. A large body of peer reviewed research links glyphosate to cancer, reproductive problems, liver, kidney and skin cell damage, antibiotic-resistance, and more – but Monsanto doesn’t want the public to know the truth! Choose to buy only certified organic food and products. This will hit Monsanto where it really hurts, their bottom line! Their best-selling products like Roundup and GMO seeds are banned on organic farms. If all farms were organic these products would bite the dust! This is voting with your dollars and is the most effective way to force change. Share this post with everyone you know! Expose their corruption. They should be shamed for this! Especially if you know anyone who is still eating non-organic food or using Roundup around their homes, make sure you get this information in their hands. Ask your favorite companies to test for glyphosate and get certified. Wouldn’t it be nice to know if the food you buy contains glyphosate? I have an exciting announcement! The Detox Project just launched a new “Glyphosate Residue Free Certification” program and will begin labeling products that have been tested and are free of glyphosate. I’ve partnered up with them to help spread the word – They are working with food manufacturers and grocery chains, so that soon we will see labels like this on some products – send this link to your favorite companies and ask them to go glyphosate free. Everyone deserves to know exactly what they are eating and have access to safe, affordable food. My job will not be done until this is a reality. I’m so happy to have so many of you by my side and I know we can make this happen! CBD oil, which is not at all psychoactive (doesn’t make anyone ‘high’) is now specifically listed as a Schedule 1 drug, meaning it has NO medicinal value and a high abuse rate. Lots of people have been using CBD for arthritis pain, migraines, seizures, rheumatism, tendonitis, and other things. For some people, it is the only thing that has helped them, and now, it is going to be illegal, by a rule. Here is an article on it. This almost seems like a hail Mary attempt at asserting control over people’s right to self-determination on cannabis. Too many people now know that the only reason this is “controlled” is to control the health and -access to- well being that is definitely a human right.For some reason, many people seem to think that only doctors and pharmaceutical companies know how living beings should deal with the rigors of being alive. DENVER — A cannabidiol hemp oil used by some families of children with seizures has been officially named a Schedule I drug by the DEA. “Schedule I drugs, substances, or chemicals are defined as drugs with no currently accepted medical use and a high potential for abuse,” the DEA says on its website. That puts the oil in the same category as heroin, LSD, ecstasy, meth, peyote and marijuana. The DEA published the details about the change in the Federal Register. It applies to any “extract containing one or more cannabinoids that has been derived from any plant of the genus Cannabis,” the Federal Register posting said. During the comment period for the new rule, one person asked for clarification of whether the new drug code would be applicable to cannabidiol (CBD). The DEA responded to say any cannabis plant extract that contains CBD and no other cannabinoids will still fall within the new drug code. Read the details about the new drug code here. For those who are appalled at the killing of LaVoy Finnicum and the categorization of the Malheur occupiers as “terrorists”, the following article will both give you additional insight and agitation. If you have additional articles that bring deeper clarity to the debacle in Oregon, please feel free to share links in the comment section. Source: Lew Rockwell – by Roger I. Roots, J.D., Ph.D.
For the past six weeks Oregonians have been treated to a political trial of the “Malheur 7” (Ammon Bundy, Ryan Bundy, Shawna Cox, Jeff Banta, David Fry, Neal Wampler and Ken Medenbach,). I was privileged to have a ringside seat at the trial as a volunteer researcher and paralegal for Ryan Bundy (who represents himself) at the trial. As I write these words, the jury is out, considering whether the defendants conspired to prevent U.S. Fish & Wildlife Service or Bureau of Land Management officers from performing their duties at the Malheur National Wildlife Refuge in rural eastern Oregon. The Bundy brothers and other defendants are alleged to have participated in an “armed standoff” occupation of the Refuge during January 2016 (while protesting the unconstitutional occupation by the federal government itself over the Refuge and other public lands). The trial has revealed an astounding brave new world of modern surveillance and surreptitious “law enforcement” techniques. Drones flew over and recorded much of what went on. FBI agents captured and monitored every phone number connected between every participant. A search warrant after the fact gave the government permission to surf through 36 Laptops, smartphones, flash drives and other devices to build the government’s case. The FBI turned the analysis of Facebook likes, dislikes, messages, and posts into a science, with multiple agents assigned to that social media alone. Outside the Refuge, FBI, Oregon State Police, and other law enforcement agencies swarmed over the countryside. Government snipers appeared on local rooftops. Barricades and barbed wire were erected to protect the school and courthouse from the alleged militia danger. Undercover FBI agents dressed as redneck militia members roamed through local stores and menaced the streets. And there were undercover government informants. Everywhere. Suspicions that the government’s narrative was largely erected with undercover agents were borne out during the first week of trial. It was revealed by an Oregon State trooper that one of Ammon Bundy’s “bodyguards”—a man who drove him to his arrest—was an undercover informant. Another informant (“Mama Bear”) was revealed when a defense lawyer subpoenaed her for the defense. The woman admitted that her entire trip to the Malheur Refuge was funded by the San Diego FBI office and that she was paid thousands of dollars to inform on the occupiers while helping out in the kitchen. Each of these informants were revealed by accident. Federal prosecutors vociferously refused to provide the names of other informants—citing case law that holds such revelations may put informants in danger. Prosecutors even used secret information—not provided to the defense—to cross-examine “Mama Bear,” to the prejudice of the defendants. Significantly, the prosecution’s most damning evidence collapsed at the end of the trial when it was revealed that the man who ran a militia shooting range at the Malheur Refuge was himself an undercover agent. Through the hard work of defense lawyers, “John Killman” was identified as a paid (“reimbursed,” he said) informant who traveled to the occupation at the behest of the government in a beat-up pickup truck tolead the occupiers in combat “safety” training.“Killman” had even trained defendant Jeff Banta to stop cars and pull out their drivers at gunpoint. Mandela/Quantum Effect- Is this the Strong Delusion? Many people are saying that those who perceive the Quantum effect (Mandela is really insufficient) are suffering from serious memory lapses, lack intelligence, can’t tell their own perceptions from reality, are retards, idiots, morons, under demonic spells, victims of mind control, or even much more ugly and insulting names. Many of the more heinous insults come from self-described “good Christians”. Evidently they are unaware of what scripture teaches (as of this writing) about the fruits of the spirit. Why is this so important that I keep going on and on about it? Because now, Yeshua Messiah is instructing His followers in Luke 19:27, a parable of the Kingdom of Heaven, to “But those mine enemies which would not that I should reign over them, bring hither and slay them before me.” He NEVER said that. It is a lie. It was either “cast them from my presence” or “remove them from before me”. This is across ALL translations in English. Y también a aquellos mis enemigos que no querían que yo reinara sobre ellos, traedlos acá, y degolladlos delante de mí. All of you “teachers” and “preachers” of scripture who say nothing has changed in any scriptures, and that those of us who note these changes are ANY of the above insulting names or attributes, I am begging you NOW to repent and fall on your face before the Almighty Creator Yahuah, and beg for the eyes to see and the ears to hear. I don’t want you to be in the place that Yeshua said many would find themselves in Matthew 7: 22-23. To me, it seems this is definitely the beginning of the strong delusion. It’s going to get worse, too. Remember that in John 16:2-3 Yeshua told us before hand that they would kill us thinking they do YHVH a service. So those of you who see these changes, be strong and gird yourself. Especially believers that know there have been some substantive changes in scripture- don’t be afraid. Read John 16:2-3, He told us beforehand. There has never been a time when it is more important to cry aloud and spare not, and let others know that the time is short. For those who don’t see any of the changes at all, and for those who see changes but are not yet believers in Yeshua Messiah, please seek Him. If you don’t do so soon, you may not be able to even make a decision to try in the future. It’s like the Ministry of Truthlessness is taking over. Everything is becoming a lie and a fraud, and people are not even going to be able to trust their own minds and memories as this worsens. Here are many pictures of things showing some of the more common changes that have occurred. They show how some of the memories of people are indeed telling the truth. There is a little commentary by each picture. When the video tape is played, the film has changed, on the shelf, to show BerenstAIn Bears. This is the earliest known effect. Then there is the issue of Looney Toons. Why would there still be Tiny Toons, but no Looney Toons? Why wouldn’t it be Tiny Tunes? If you are capitalizing on name association, wouldn’t it make sense to follow the name? And people remember Looney Toons…some ebay clippings show it is very deeply ingrained in many. Note the title of the auction has Looney Toons in it even though the cards clearly read Tunes. No one spells iTunes iToons. Hmm? Then there is the advertisement for Fruit Loops. However, if you look for a cereal box that says “Fruit Loops” you will never find one. Chic Fil A. Not Chick Fil A. Also, the Peanuts cartoon creator’s name has changed. Below are pics of a newspaper that was pre-change, and a book we have here that shows the name change from Schultz to Shulz. 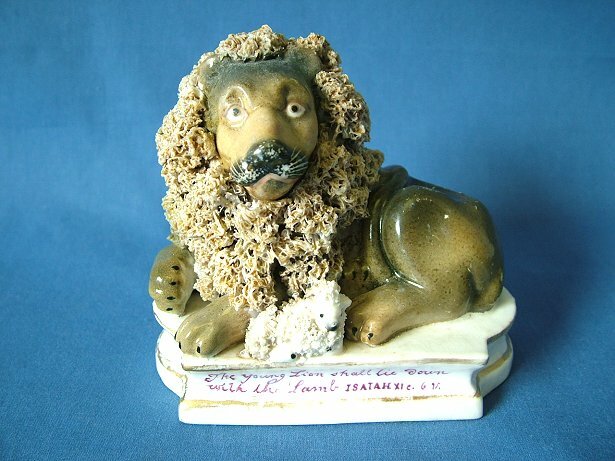 The figurine above is from the 1840’s and says “The young lion shall lie down with the Lamb” Isaiah 11:6. So there is a little residual evidence for you. This could not be time travel because all evidence would be wiped entirely if it were. While there could be memories of a difference, there would be NO proof that it actually was different as evidenced above. We are here, in the same place we have always been, and our time is still running in the direction Yahweh designed us to operate in. My youngest isn’t shrinking and getting ready to go back to the womb. People in my life haven’t died in my mind only. Those who know me, still know me. This is not a conspiracy theory. What is happening is actually happening even though it sounds completely crazy and weird. Things on our shelves are changing. These are things we have had for years in many cases. We are not talking about new releases or new translations here. Yet aside from many others having the same recollection as ourselves, the physical evidence isn’t that readily available. But there is some there. I hope that I have been able to help some of you understand that this isn’t a joke. To me, the most important thing is scripture changing. I hope you understand why….Shalom! I thought this was a very good article. It seems a completely futile course of action to continue to talk to the furniture in DC, and because of that, I have not been encouraging people to continue to engage in unprofitable action. Does anyone remember that Obama promised to label GMO’s? I know some voted for the cretin on that promise. 8 years after the fact, and the only meaningful things that have happened are at the state level and in public awareness. Neither of which has had any effect on the District of Criminals regulatory or legislative actions. On Thursday, the U.S. Senate Committee on Agriculture, Nutrition, and Forestry agreed on a new bill aimed at labeling foods with genetically modified ingredients. The committee has been trying for several months to get a bill passed before Vermont’s labeling law goes into effect on July 1. U.S. Senate Agriculture Committee Chairman Pat Roberts and Ranking Member Debbie Stabenow released a statement, calling the bill “an important path forward that represents a true compromise. Since time is of the essence, we urge our colleagues to move swiftly to support this bill.” Roberts said if his colleagues do not act on the bill now Vermont’s law will cause confusion in the marketplace. The bill would give the U.S. Department of Agriculture two years to write the labeling rules. The bipartisan proposal would immediately prohibit states and cities from passing labeling laws for genetically modified or engineered ingredients. Genetically modified or engineered seeds are engineered to have certain traits, such as resistance to herbicides. The majority of the United States’ corn and soybean crops are now GE, including a large portion that is used for animal feed. The bill would also put the USDA in charge of establishing “a uniform national disclosure standard for human food that is or may be bioengineered.” Critics of a federal standard worry about the USDA being pressured by biotechnology companies that have a close relationship to U.S. regulatory agencies. The proposal would also require companies producing foods with GE ingredients to post a label, including text on package, a symbol, or a link to a website (QR code or similar technology). Smaller food manufacturers can use websites or telephone numbers to disclose ingredients. In late February, Roberts introduced another bill which attempted to create a federal voluntary standard for labeling GE food. Roberts’ Senate Bill 2609, or the Biotech Labeling Solutions Act, would have blocked mandatory labeling efforts by states. In March, the bill failed to reach the 60 votes needed during a procedural vote, with 49 votes in favor and 48 votes against. Roberts’ bill was similar to the controversial Safe and Accurate Food Labeling Act, which passed the House in June 2015 but ultimately failed amid heavy opposition. 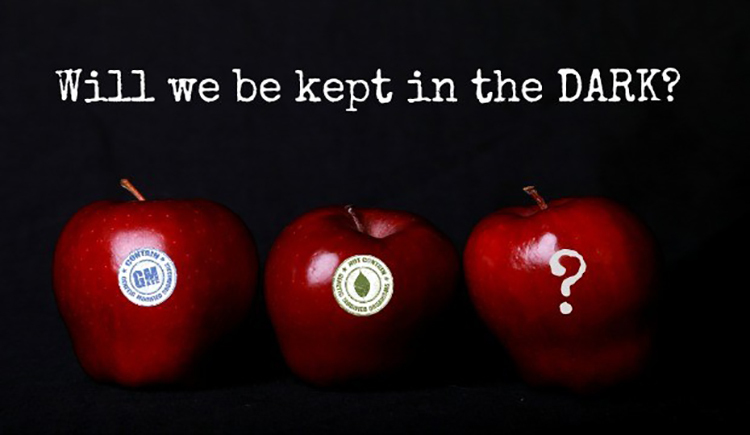 To critics, the bill was known as the “DARK” (Deny Americans the Right to Know) Act because the law was also aimed at nullifying GMO labeling measures, such as the bill passed in Vermont. The latest bipartisan effort contains language that is identical to both of the previous bills. The bill would “amend the Agricultural Marketing Act of 1946 to require the Secretary of Agriculture to establish a national voluntary labeling standard for bioengineered foods.” It’s safe to say that this new bipartisan compromise is simply the latest version of the DARK Act and will likely live up to it’s name by keeping Americans in the dark regarding what is in their food. The bipartisan proposal is supported by certain food industry groups that believe state bills like the one in Vermont will lead to increased costs for agriculture, food companies and consumers. “This bipartisan agreement ensures consumers across the nation can get clear, consistent information about their food and beverage ingredients and prevents a patchwork of confusing and costly state labeling laws,” Pamela Bailey, president of the Grocery Manufacturers Association, the largest food industry lobby group, told the Associated Press. The key argument seems to be that the new bill would not have as clear labels as Vermont’s law. Senator Stabenow, however, believes the opposite, claiming that the Vermont law would require GMO labeling of a cheese pizza but not a pepperoni pizza. “Throughout this process I worked to ensure that any agreement would recognize the scientific consensus that biotechnology is safe, while also making sure consumers have the right to know what is in their food,” the senator wrote. The scientific consensus does lean towards the safety of GE foods, but that has not swayed critics and supporters of labeling. A recent report from the National Academies of Science, Engineering, and Medicine concluded GE foods do not pose a health or environmental risk. Critics of the report point to conflicts of interests between researchers with the National Academy of Sciences and biotechnology companies involved in the creation of GE crops. The environmental watchdog organization Food and Water Watch released their own report, pointing to possible influence from the same organizations that stand to benefit from the growth of genetic engineering of foods. The report, Under the Influence: The National Research Council and GMOs, looks at “far-reaching ties” between the National Research Council, its parent organization the NAS, and biotechnology companies and agricultural corporations. Americans who want to know what is in their food need to take control of their own food production and stop relying on large-scale, factory farming which increasingly relies on genetically engineered seeds. Only by taking back the power when it comes to our diets can we stop supporting the systems that are working against our health and freedom. It’s time to grow food, not lawns. It’s time to throw seed bombs everywhere. The revolution is growing and resistance is fertile.